Sciaenidae is a family of fish commonly called drums, croakers, or hardheads for the repetitive throbbing or drumming sounds (which they make themselves) heard under water. The sounds are produced by the beating of abdominal muscles against the swim bladder. The family includes the weakfish, and consists of about 275 species in about 70 genera; it belongs to the order Perciformes. 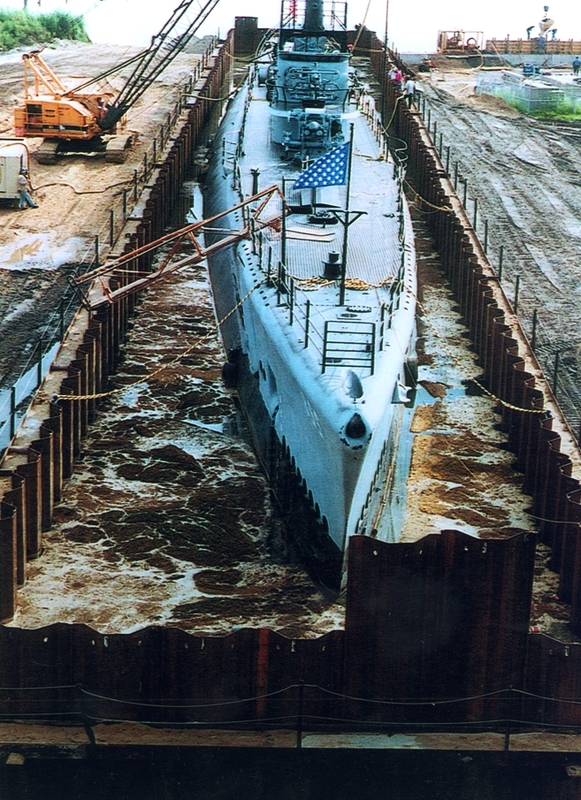 The keel for USS Drum (SS-228) was laid down on September 11, 1940 at Portsmouth Naval Shipyard in Kittery, Maine. 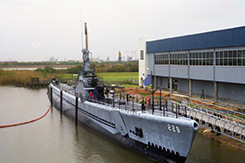 She was launched on May 12, 1941 with Mrs. Thomas Holcomb as sponsor. 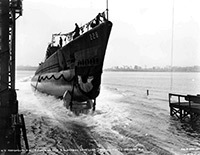 USS Drum was commissioned on November 1, 1941 with Lieutenant Commander Robert H. Rice in command. The Drum was the first of the Gato-class submarines to be commissioned and enter WWII. 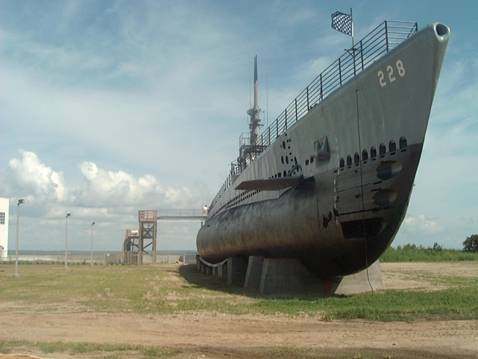 The 77 Gato-class submarines were the star workhorses of the Pacific war with Japan throughout WWII. 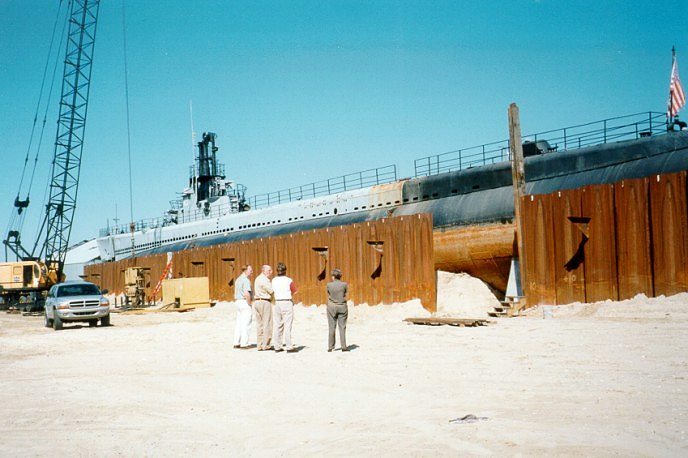 Amazingly, 20 of the 52 lost submarines in WWII were of Gato-class. 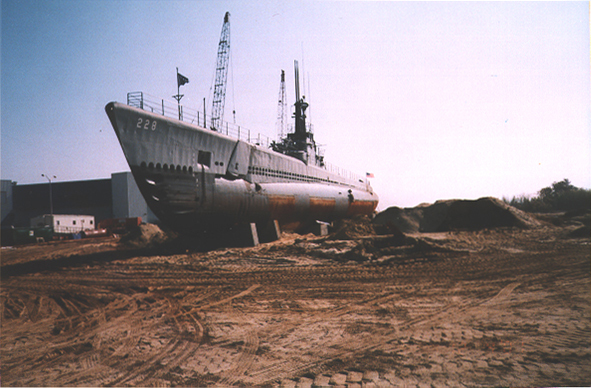 The submarine's emblem of the octopus banging the drum was created by Walt Disney. Walt Disney Studios designed many unique emblems for military units throughout the United States Armed Forces in WWII. USS Drum's radio call sign is NITG (November, India, Tango, Golf) as seen in the logo at the top of the screen. 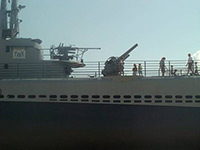 On November 22, 1943 while on her 8th war patrol, the Drum suffered a severe depth charge attack. 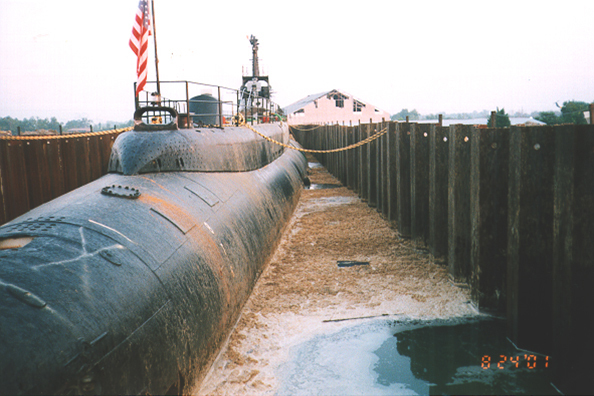 The aft door frame upper hinge and adjacent plating in the conning tower (common on early Gato-classes) cracked and was letting in water at about two to three gallons per minute when submerged. 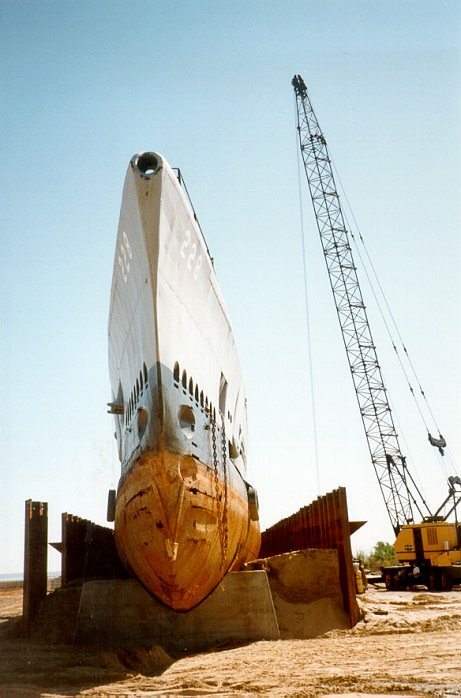 The Drum headed immediately for Pearl Harbor, where an attempt to fix the door was made by replacing the after bulkhead with a new one without the problematic aft door. 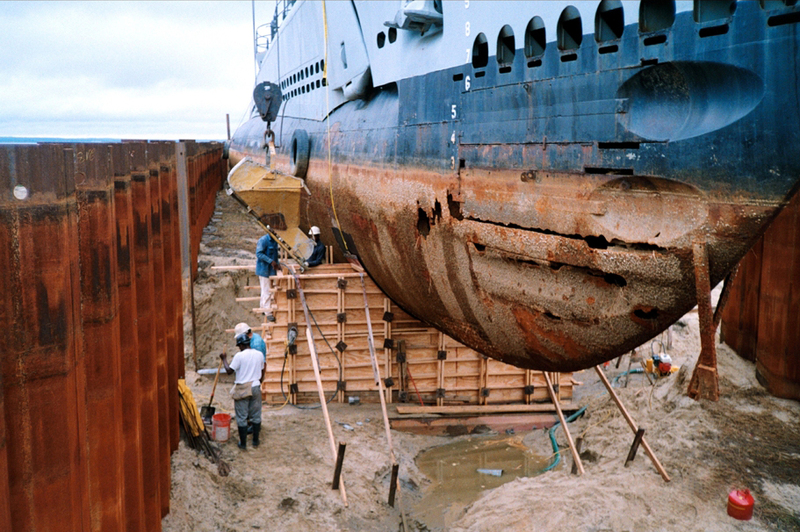 However, on a test dive on January 1, 1944, the conning tower began to buckle. Lockwood sent the USS Drum to Mare Island for an overhaul and a entirely new conning tower. 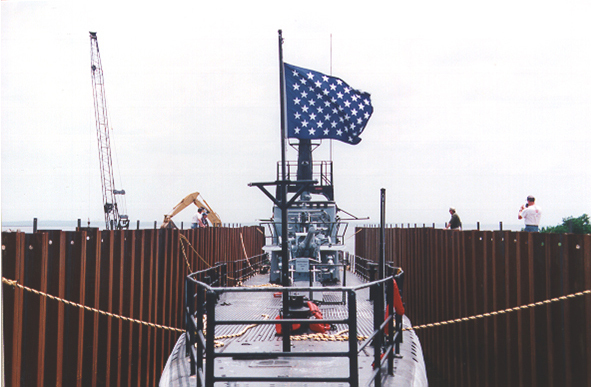 At Mare Island, she received a new, much stronger Balao-class ("thick hull") conning tower. This makes the Drum very unique! She's a Gato-class submarine with a Balao-class conning tower. 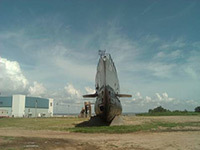 Details of the conning tower upgrade can be found in the prologue of her 9th war patrol. While on her 10th war patrol the Drum sank a sampan in a battle surface attack. Two Japanese prisoners were taken aboard - Chono Natsumori and Keiei Shimochi. 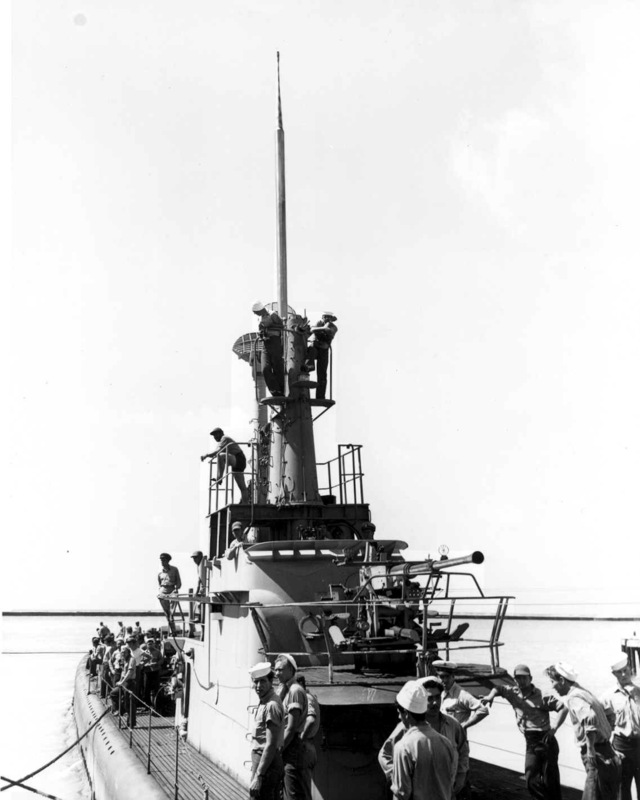 The Drum made 13 war patrols in WWII, 9 of which were deemed "successful". 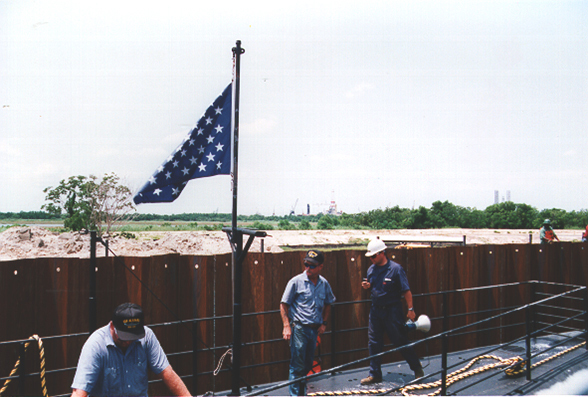 Every submariner onboard for each "successful" patrol earned his submarine combat insignia pin or else earned another star for their submarine combat insignia pin. She earned 12 battle stars for her service in WWII. 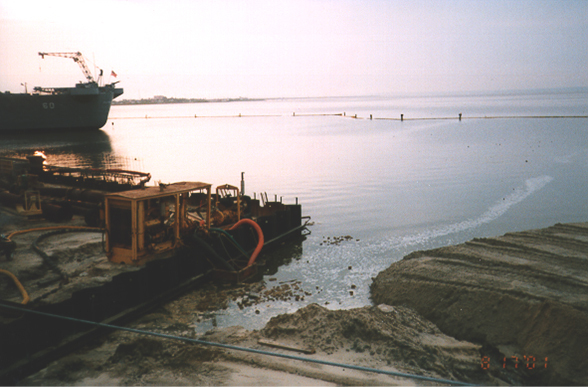 The crew claimed to sink 27 enemy vessels, but JANAC (Joint Army Navy Assessment Committee) officially credits the Drum with the sinking of 15 enemy vessels for a total of 80,580 tons. 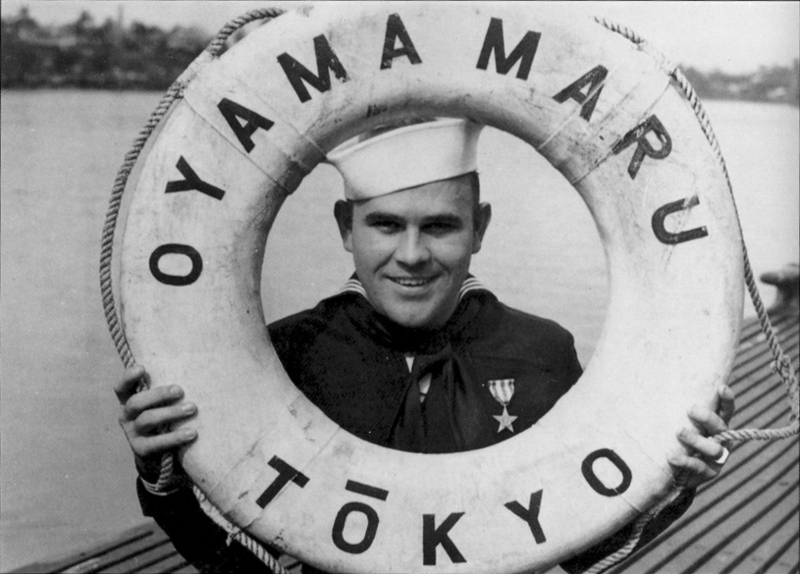 Discrepancies between submarine crews and JANAC are common for all submarines throughout WWII. 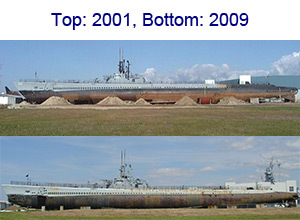 This is the eighth highest of all WWII submarine confirmed sinkings. 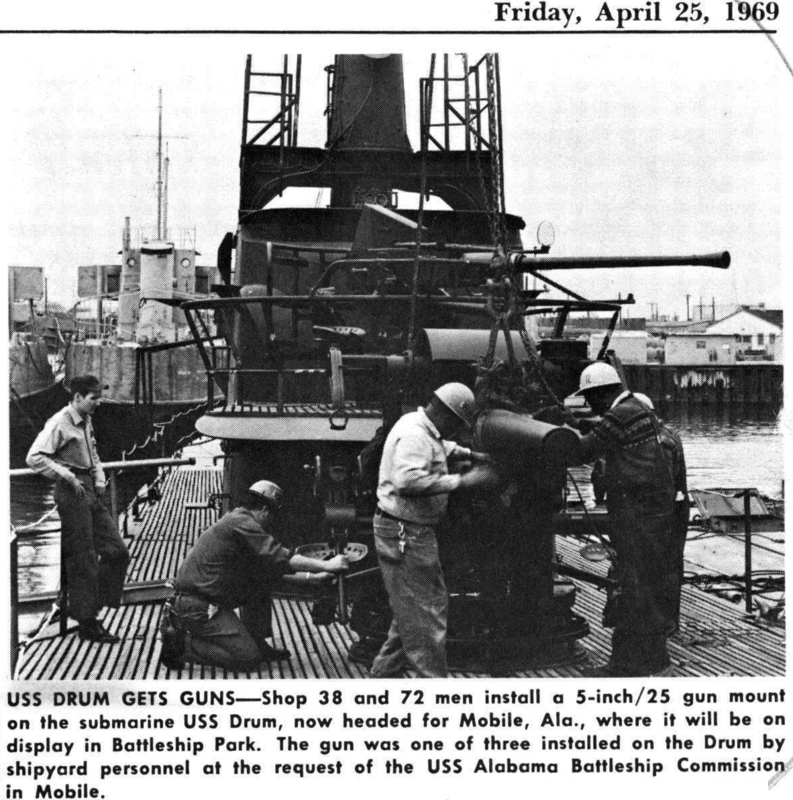 Take a look at all 13 of the USS Drum's WWII war patrol reports. There is also an unofficial 14th war patrol, unofficial only because the war ended just days before the Drum could reach her assigned patrol area at Saipan. 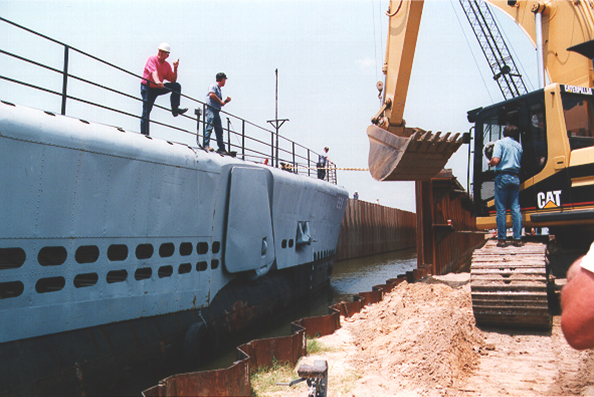 She went on this patrol with a pair of 5"/25 deck guns! 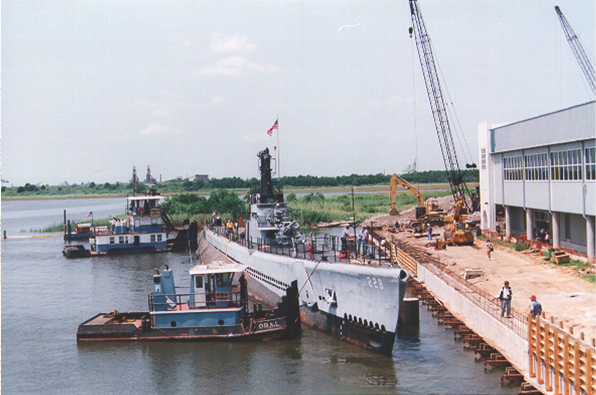 USS Drum was decommissioned on February 16, 1946. 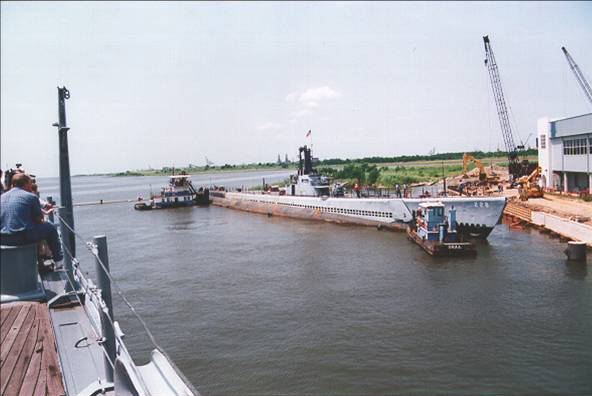 On March 18, 1947 she joined the Atlantic Reserve Fleet, New London, as a training submarine (one weekend per month) for Washington area Naval Reservists in the Potomac River Naval Command. 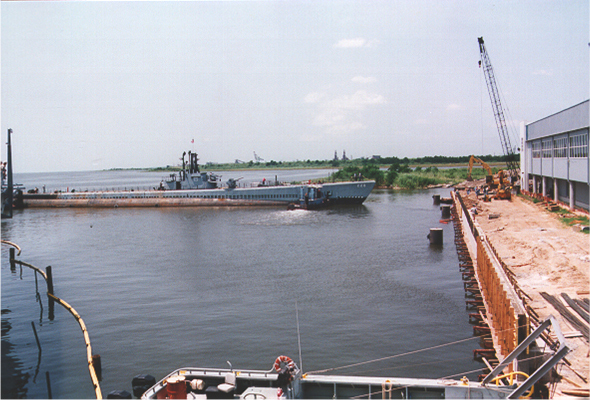 The Drum was reclassified as an Auxiliary Research Submarine (AGSS-228) on December 1, 1962. In June of 1968, the USS Torsk (SS-423) replaced the Drum as the training submarine for Washington area Naval Reservists. 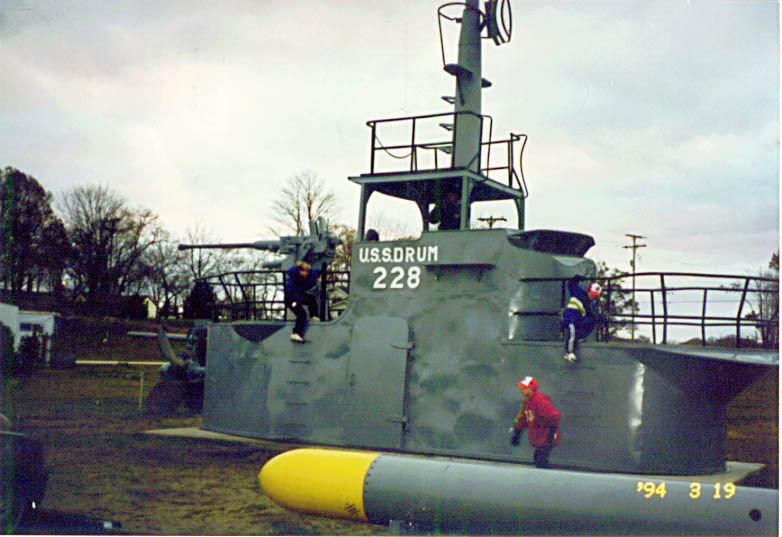 The USS Drum was then struck from the Naval Register on June 30, 1968. 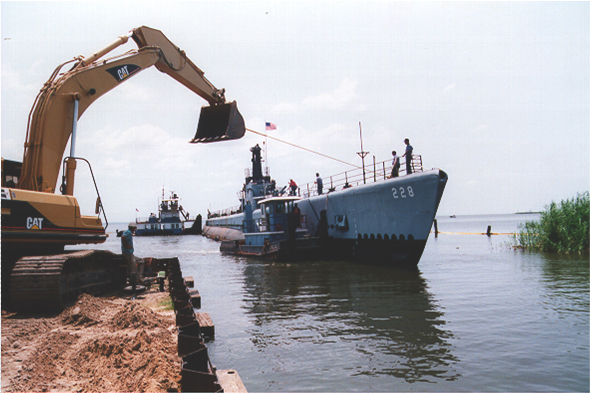 Note that the Drum never went through post-war conversions like many other Gato boats that survived the war. Some minor modifications were made due to serving as a trainer, but no major conversions like GUPPY or SSK. 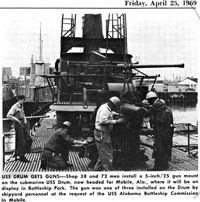 The USS Alabama Battleship Commission, pleased with the results of the USS Alabama (BB-60) battleship as a museum since January 9, 1965, decided to try the same thing with a submarine and save the Drum from scrapping. 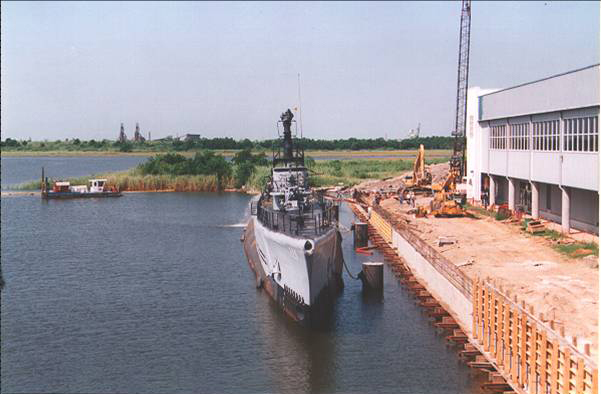 On April 14, 1969, she was transferred to the USS Alabama Battleship Commission. On May 18, 1969, USS Drum (SS-228) arrived under tow at Battleship Memorial Park. 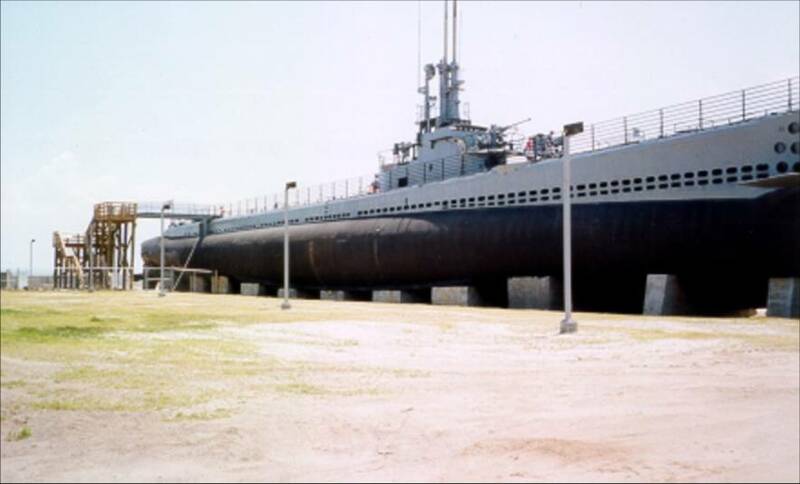 She was opened to the public on Friday, July 4, 1969 and became the nation's first submarine to be on permanent display as a museum. 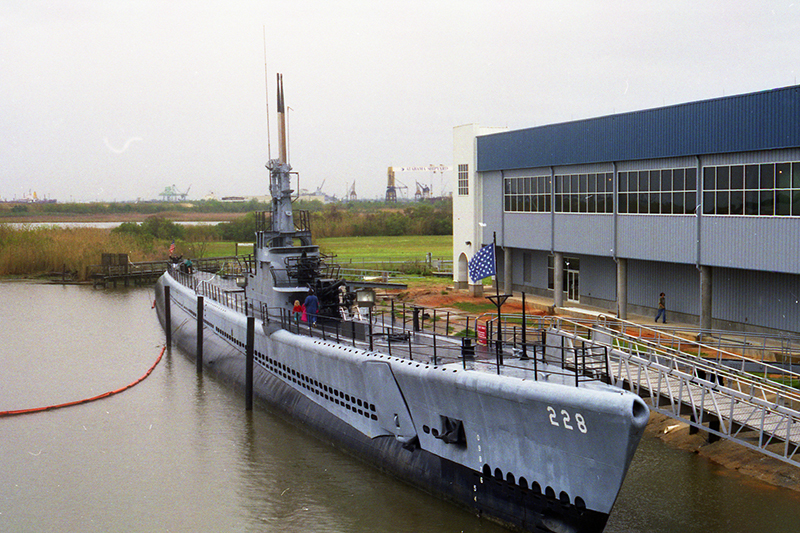 The USS Drum proved that the WWII era submarines could have a second life as museums. The Drum was popular, and was even making money from tourism. I understand that she had over 300,000 visitors during her first year as a museum. 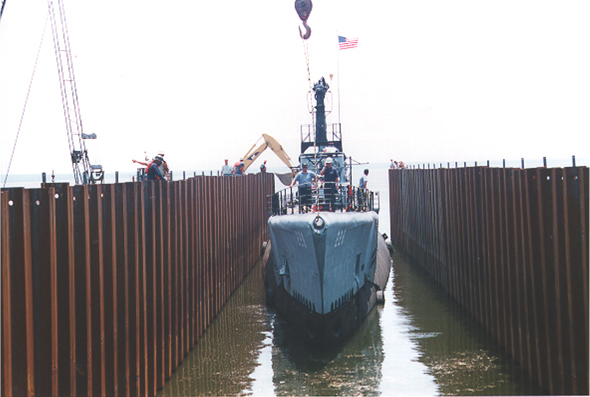 This helped pave the way for all submarine museum boats that followed behind her. 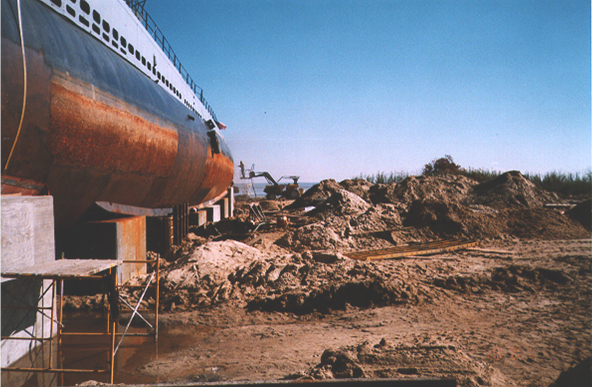 However, life at the edge of Mobile Bay isn't always perfect. 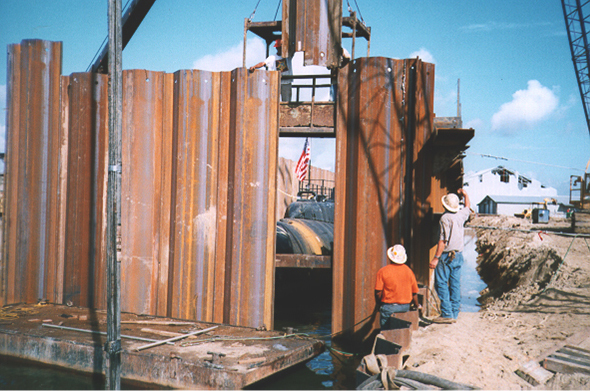 The Drum has been subjected to numerous devistating hurricanes over the years as they pass from the Gulf of Mexico onto land. 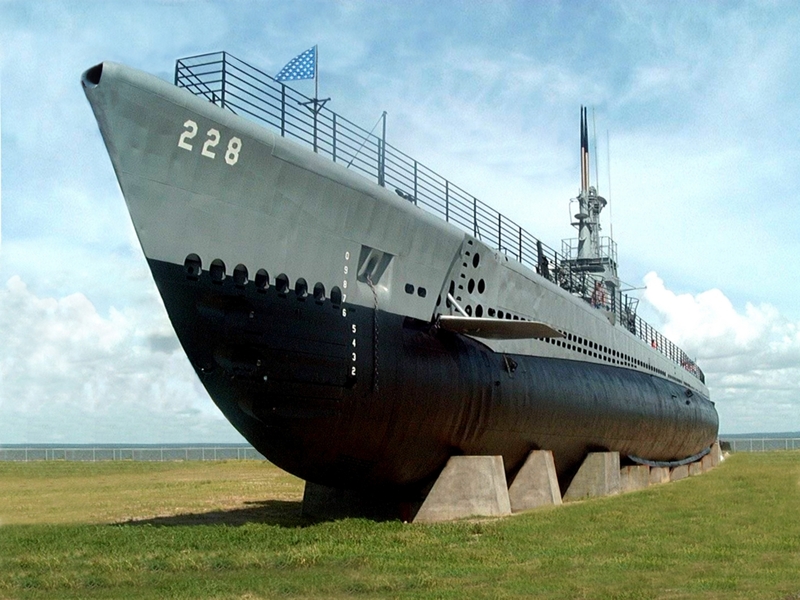 On January 14, 1986, the USS Drum (SS-228) became a National Historic Landmark. 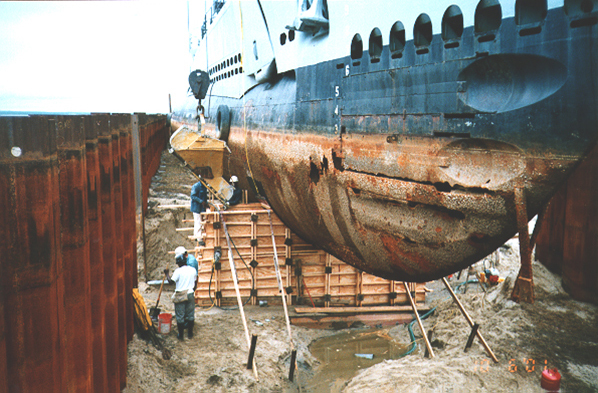 Her National Register Number is 8600086. You can view the nomination form and the photos attached online. Apparently someone many years ago at Battleship Memorial Park constructed a replica of her old sail. 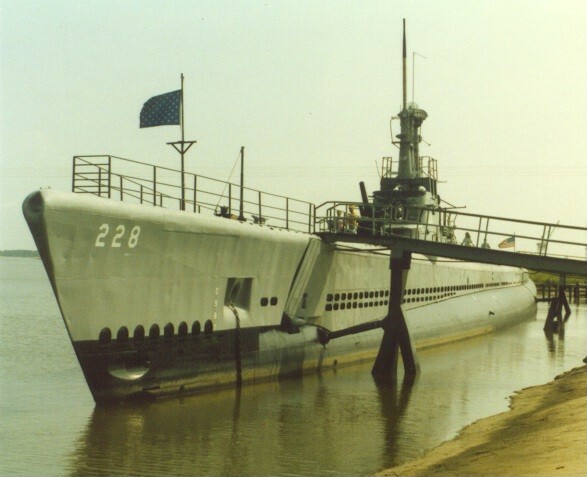 It is no longer located at Battleship Memorial Park, but now resides at the Great Lakes Naval Memorial and Museum in Muskegon, Michigan with USS Silversides (SS-236). They acquired it sometime in the mid-1990s. While the Drum did retain a large portion of her equipment, most of it is in a non-functioning state. The klaxon (dive alarm) works and the hull opening indicator light panel (aka "Christmas tree") is lit up. 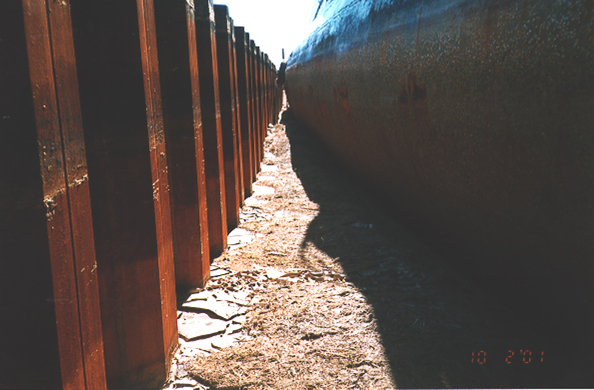 Neither of the periscopes are originals and they do not move, but regardless one of them can be viewed through. The 'scope is aimed directly at the "target" (USS Alabama)! 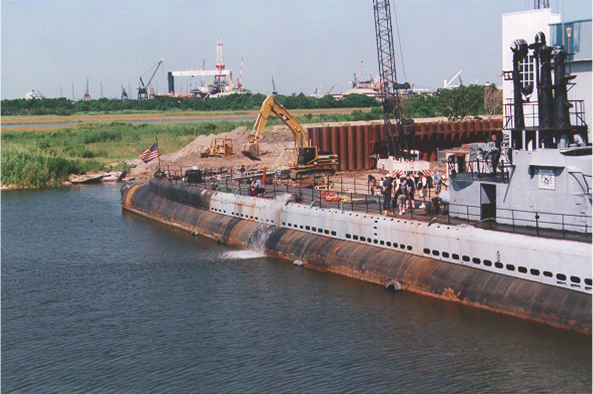 There are also many restored (exterior) torpedoes onboard, including a Mark 27 electric "cutie" torpedo. 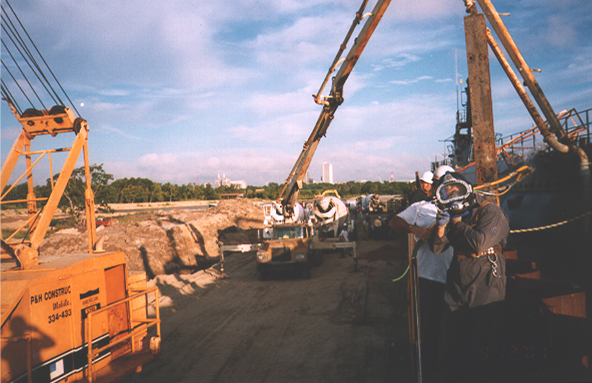 Beginning in the early summer of 2001, the Drum was moved from the muddy Gulf of Mexico waters beside the USS Alabama battleship and placed on dry land on a permanent fixture beside the newly constructed aircraft pavilion. 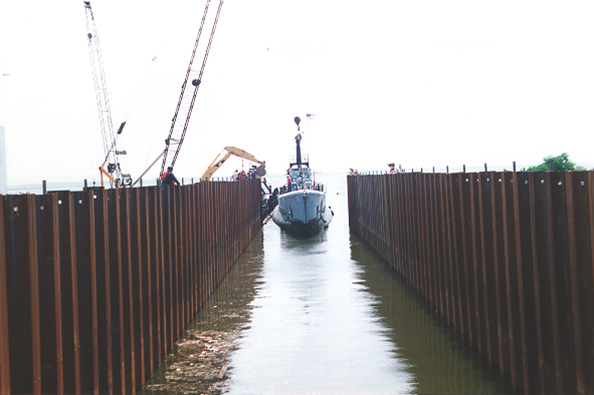 Volkert & Associates, Inc., an engineering design firm, handled the move. 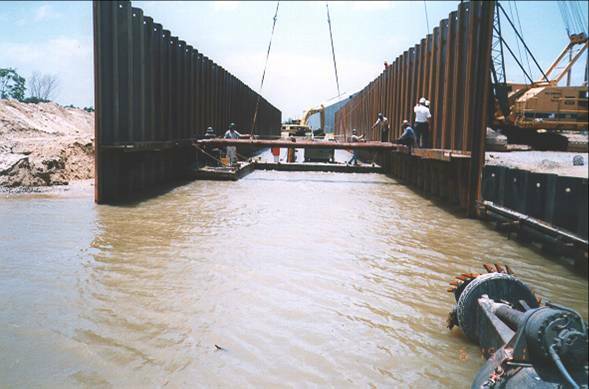 This was done by digging a small canal, flooding the canal, floating the boat into the canal with the help of tugboats, and then draining the canal. 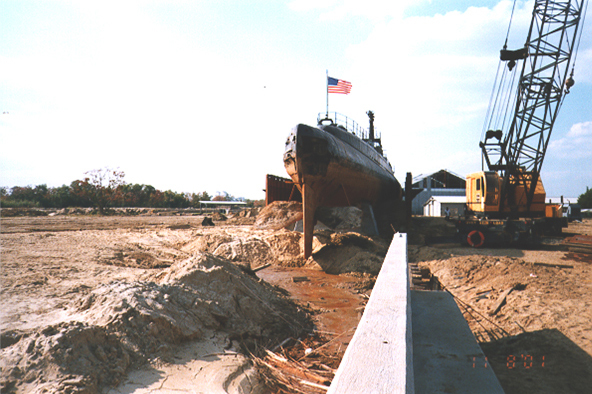 Then she was placed upon and chained to large, concrete cradles. 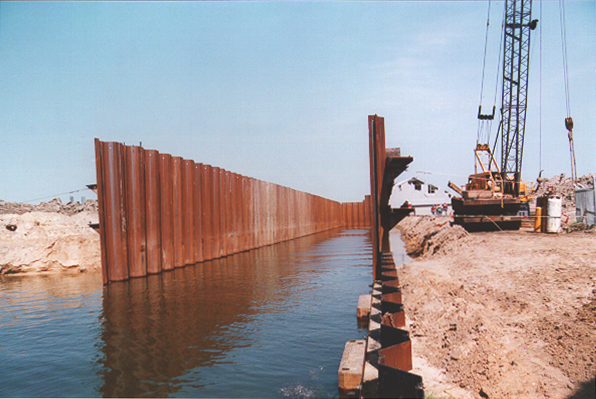 The approximate cost of this move was $1.4 million. 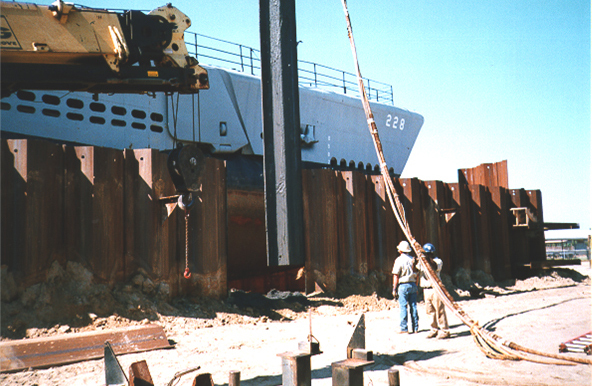 The feat earned numerous awards for engineering. 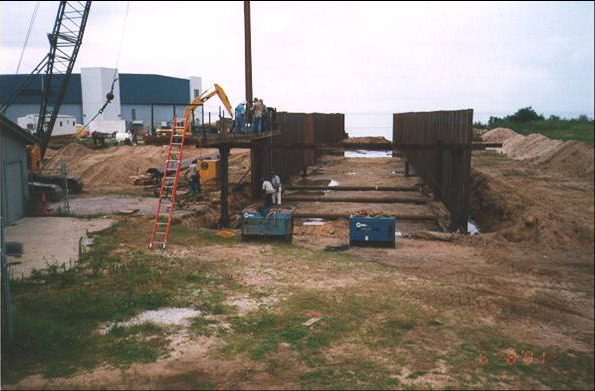 The photos of the move to land below were provided to me by Volkert & Associates, Inc. to use on this website. Please click on any of the images below to see a larger version. A major reason for the move was for preservation. 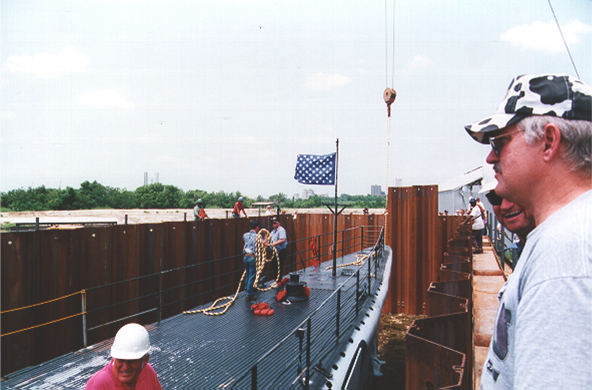 Not long after being placed on land, the Drum was sandblasted and painted. However, this paint has proven to not stick very well over time. 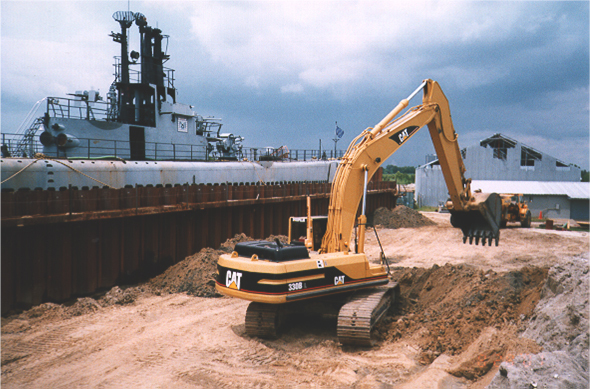 Besides the exterior concerns, the interior also has maintenance and restoration issues. She is showing her age! 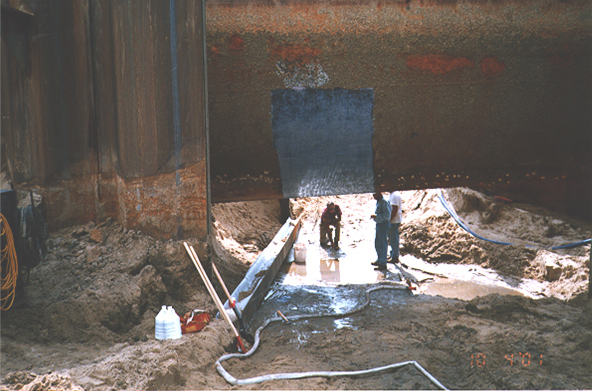 Volunteers are always needed to help in any way they can. 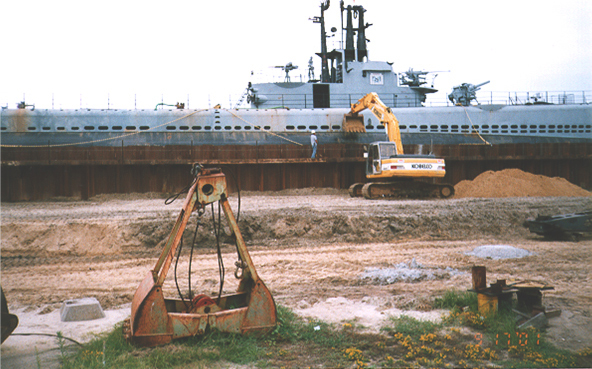 You may not know that Battleship Memorial Park operates independently from tax funds. 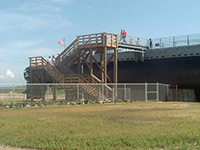 Therefore, revenue from visitor admission to the Park and proceeds from sales in the gift shop are spread around thinly. Visitor traffic and awareness are vital for the future of the Drum! 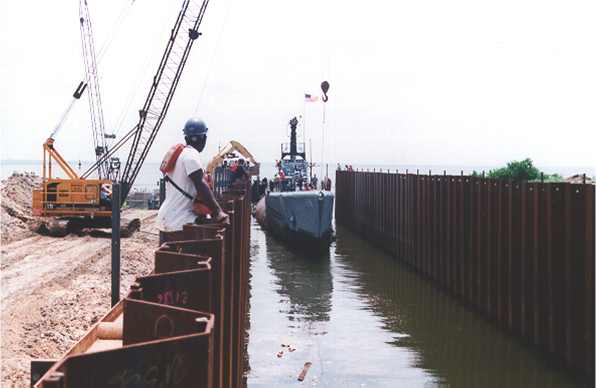 Thanks to NavSource.org for many of the photos you see on this page. Please contact me at the email address shown at the bottom of the page if you have anything to share on this website - I'm always looking for more to add here!